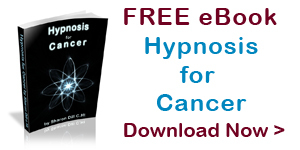 How can hypnosis help for cancer? Hypnosis is a powerful but gentle technique that can help with cancer on many levels. Stress & anxiety is one of the major causes of disease. Lowering stress & anxiety levels help balance the body’s PH levels & bring back balance. This helps restore health & well-being. Therefore, a vital part of feeling better is reducing stress levels. This can be done in a number of ways, even without hypnosis: Meditation, visualisation, counting one’s blessings, focussing on positive thoughts, affirmations, humour (funny books / movies) etc. However it is not always easy to focus on good things when one is feeling ill and fearful. Hypnosis is the answer. Learn to relax the body completely. This is taught to the client in autogenic training. Here the client actually is taught to manage self-relaxation – to physically relax the body completely – without outside help. Learn to relax the mind completely: self hypnosis training – to be able to access a positive state of mind very quickly and effectively. This is exceptionally useful in many ways, such as accessing happier memories, finding that place in the body where you feel the best / healthiest & focus on that & make it spread, positive visualisations such as visualise healing rays / pac-man racing through the body eating up all the cancer cells / the white cells being knights in white armour fighting all the cancer cells / taking a healing ‘shower’ / a healing light passing though her body, washing away all the cancer cells and renewing the existing cells .. These are just a few visualisations – there are many many more. Guiding the client back to a time when he/she was healthy happy. Activating cellular memories of health & amplifying that healthy feeling, so that it spreads over the entire body. Working through and releasing limiting beliefs & negative emotions. Getting client to visualise him/herself 10 – 15 years in the future – experiencing health & being able to enjoy life & attend children’s weddings & see grandchildren grow. Bringing down stress levels in the body & mind, which promotes feelings of well-being. Help the cancer client to feel they have a measure of control over their body, which is a big boost. Relaxation brings down the acidity level in the body & promotes healing. Focusing on healing images & visualisation brings about physical changes in the physiology of the body. Hypnosis is extremely effective for pain control. Various methods are used to teach the client highly effective pain-control techniques. The acidity level in the body will go down as less pain is experienced. Chemo / radiation can be very hard on the body. Hypnotic suggestions for boosting the immune system can help the body cope. The side-effects of chemo or radiation treatment are well known. Hypnosis can reduce these significantly for a better quality of life. Hypnosis can help the client reframe this experience as a healing process for a positive state of mind. Unhealthy lifestyle – such as leading an exceptionally stressed life / unhealthy meal choices / no exercise / no relaxation / smoking / drinking. Environmental Issues: Poisons / additives / preservatives in our food. Polluted rivers & oceans contaminating fish & marine life. Plastics which disintegrate & make their way into our food (microwave cooking is one way this happens). Other hazards in our environment & work situations. Deep-seated unresolved problems & issues, such as personal problems, childhood issues / trauma, to name a few. Hypnotherapy is excellent for finding these and resolving the conflict, so that true healing may occur on all levels. What is Genetically Modified Food & what does it do to our body?